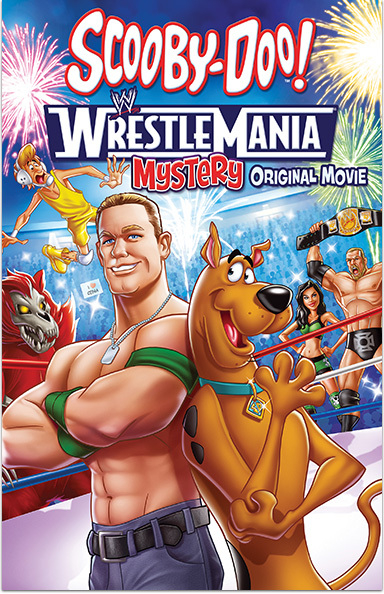 In this all-new movie Scooby and Shaggy win tickets to WrestleMania in Wrestle City. To protect the WWE championship belt the Gang get help from WWE superstars. SCOOBY-DOO! WRESTLEMANIA MYSTERY © 2014 Hanna-Barbera Productions, Inc. SCOOBY-DOO and all related characters and elements are trademarks of and © Hanna-Barbera. WWE, the WWE logo, JOHN CENA, TRIPLE H, KANE, THE MIZ, SANTINO MARELLA, AJ LEE, BRODUS CLAY, SIN CARA, and MR. McMAHON are trademarks of WWE.